In this interview on InfoQ, Greg gives a very interesting perspective on how (and also why) to use Domain Driven Design to build a complex system. I’m just coming back from the Italian Java Day, where I talked about Domain Specific Languages on the Groovy - Grails platform. I’ve uploaded the reviewed version of the presentation on slideshare, with some extra notes, if you are interested. The whole idea is related to the possibility of adopting multiple DSL simultaneously. I took some interesting hints from Guillaume Laforge, Graeme Rocher and Peter Backlund, for the DSL part, as well as some from Ninja Coding Monkey, when it came to integrate my DSL specific value Objects with Grails. However, this involves adding new behavior on the Number metaClass, which is not entirely correct in terms of object oriented responsibility assignment: it’s basically a new Money constructor that we’re attaching on the Number class instead. It works, it’s cool, but it’s definitely not the cleanest code on Earth. I don’t know if it has something to do with the Shu-Ha-Ri theory that Alistair Cockburn uses to describe the three level of experience in the agile practices (In the Shu phase you practice and learn, in the Ha phase you start applying variations to the lessons learnt, in the Ri phase you do the right thing by instinct, because you know that’s he right thing to do), but there’s something in common between the most successful approaches to software development I’ve seen. It doesn’t necessarily have to do with agility, many of these teams or individuals were indeed applying agile practices, but I’ve realized that they were doing something deeper, and agile practices was only part of it. On the other hands I’ve seen so many people completely screwing up software development, regardless of the process in place, blaming waterfall first, and then RUP, and Scrum later on. Technical excellence does make a lot of difference, but still I’ve seen really skilled people doing awful things, despite their qualities. What does still make a lot of difference is in he approach to software development, is something that is a combination of a quest for continuous improvement (something that we could maybe call lean, but that’s to close to be another label) and of desire to experiment and challenge what we already know. Learning is a non-linear process. It’s not piling up bricks of knowledge. It’s challenging what we already know against new experiences. It’s experimenting different ways to do things, and analyze the outcome. It’s something different from reading books or following advices, pretending to be right just because somebody else said that. It’s dare to be wrong. It’s trying to do something different from the last time we did the same thing, because doing the same thing twice in the same way won’t teach us anything. Put this approach in a person, or in a team, and you probably won’t need so many books. Books can provide you inspiration, for “proven” solutions, but proving a solution, is ultimately the key of our job. A friend of mine recently told me about a tricky situation he was trying to solve. A software company was supposed to develop an application, but they subcontracted development to another company. After a while, the project started going out of control: features were late, quality was poor, bugs were not fixed and release date slipped indefinitely. Things were so bad that lawyers started to warm-up. As many of you, I had a sense of deja-vu, when hearing this story. The thing that struck me was that this type of project is doomed from the start! Why do people repeat the same mistakes over and over and over? Let’s dig into the scenario: customer asks Company A to produce some piece of software. The price can be defined in many ways, but it’s normally related to a rough estimation. Anyway, Company A gets the contract. Even if they are not going to write the code, they want to be paid for the marketing, and everything that comes before the project starts, somebody will be paid to “manage” the project and some money will be allocated to cover project risk. Budget splitting from Company A’s perpective. Ideally, such project should provide a good ecosystem for communication between the customer and the developers, allowing developers to explore and to build consistently upon frequent customer feedback. In a common subcontracting scenario, Company A decides to outsource development operations to Company B. However, since the original deal was between Customer and Company A, a new deal is necessary between Company A and Company B. Sometimes this deal is completely visible to the customer, but sometimes Company A is just pretending to develop the application while Company B is developing it behind the scenes. Anyway, the new deal between Company A and Company B is based on a different project budget, since some costs (marketing, risk and project management) are accounted on Company A. Now the project may be worth about 1/3 less than its original budget (the exact figure may vary according to greediness and other human factors) but Company B still needs to allocate budget for its own project management and risk coverage: nobody wants to be sued for somebody else’s mistake. The project budget, now seen from Software Company B’s perspective. Adding two separate management boxes around the project doesn’t provide any real value in return, the financial effect is that now the project is a low-budget project, so company B will probably start looking for the cheapest software development resources available. 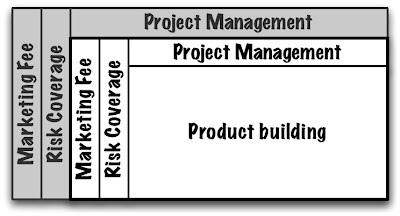 One would expect that the extra money put in Project Management and Risk Coverage would turn into a perfectly managed, risk free project. Well... not exactly so. By the way, this is often the schema which is applied in offshore software development, where the common belief is that developers are so cheap that you can compensate the extra costs related to offshoring with huge savings in product building. I am not going to dig into offshoring in this post, but it’s definitely not that simple. 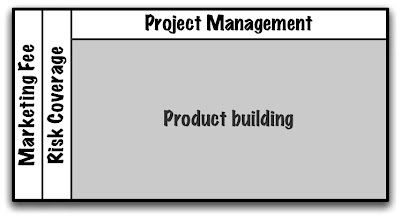 Unfortunately, this type of two-levels management doesn’t only duplicate costs, it does more: it makes the whole process inefficient, and it’s actually effectively working against project success. The subcontracting development ecosystem: formally the referring person is still belonging to Company A, but development is performed by Company B. The key communication channel is now obstructed. 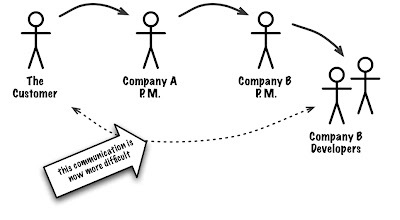 Communication flows from Customer to Company B through Company A. If Company A is the one to be paid, then all of the key discussion must pass through A, transforming the supposed Project Manager into a bottleneck. Indirect communication means delay, important information may rot in a mailbox, before being forwarded to the person associated with the solution. Indirect communication means also information loss. Some information must be understood, not only listened or read. Sometimes forwarding it’s not enough to ensure some key detail is not missing. Since the information is sensitive for two different contracts, all parties become more inclined to write key issues instead of using face-to-face communication. Some issues are then carefully evaluated and involve more negotiation on an official level. The entire process becomes then waterfallish: having three players, with higher risk and no effective direct communication, paper (specifications, change requests, and so on) becomes more important than face-to-face communication eventually slowing down the process. The customer role becomes awkward. 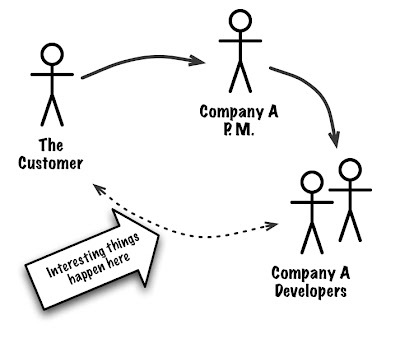 The customer is the real customer, but for Company B, Company A is ‘the customer’. Unfortunately, the quality of information you can get from a customer who is not the user of the software it’s a lot lower. So the risk of doing the wrong thing it’s extremely higher. If Company A is still pretending to be the developing company, direct communication between Company B and the Customer might even be forbidden, making things even more awkward. The overall effect of all these factors combined is often pure havoc. A project with a decent budget becomes staffed with inadequate people, in an ecosystem that obstructs good communication between the customer and the developers, and where management roles are duplicated adding costs and subtracting value. As developers, we’re probably associating this situation with the decorator pattern, which is simply adding features (a more effective marketing) to some other (the development) without changing it. Well ...this is simply not the case with subcontracting. The act of subcontracting has a negative impact on development and should be avoided or limited. As a customer, it does make a lot of difference if the software company is actually developing the software or simply playing the role of a broker. Having seen many of these situations going straight to non-recoverable state, I really think that special care about these issues should be taken in the pre-contract negotiation phase to prevent unavoidable surprises.